The Port of San Diego urges patience from residents when the agency begins trucking soil to the Chula Vista Bayfront on Wednesday for construction of a $1.1 billion hotel and convention center. Contractors will import 210,000 cubic yards of soil to the site’s 535- acre footprint west of Marina Parkway between H and G streets. Another 60,000 cubic yard will be brought to an adjacent site. Traffic will be impacted by 200 to 400 daily truck trips between 7 a.m. and 4:30 p.m. on weekdays, and likely a few Saturdays as well. Soil transport is expected to pause around July 20, before resuming early August. Trucks will enter and exit Interstate 5 via H Street, whey they will travel between I-5 and Marina Parkway before crossing Sandpiper Way north of Bayside Parkway. Soil deposits will increase elevation for the eventual buildings, which port staff said is necessary to accommodate sea level rise and improve drainage. Additionally, crews are conducting demolition work just southeast of H Street and Marina Parkway at a site known as South Campus. The work, which primarily involves removal of concrete foundation slabs and asphalt pads, is expected to finish Aug. 8. After demolition is complete, grading will occur until mid-October. Infrastructure improvements at the hotel and convention center site will likely get underway next year. That includes site preparation, as well as building new access roads and public streets. 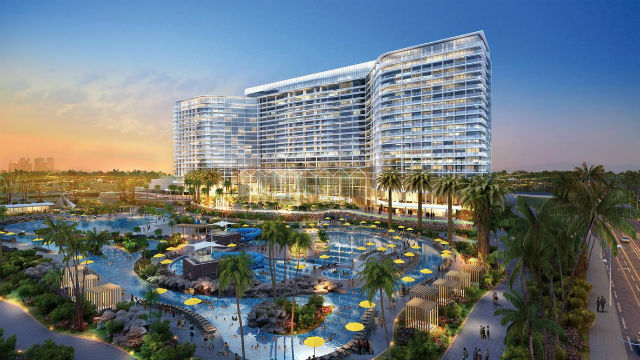 Expected to provide roughly 1,600 hotel rooms and 275,000 square feet of convention space, the project anchors the Chula Vista Bayfront Master Plan, a decade-long joint planning effort between the port, city of Chula Vista and other stakeholders.